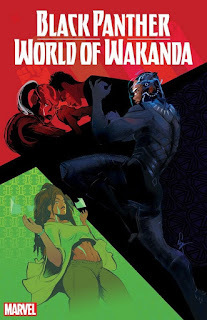 On July 22, Marvel announced a new expansion, Black Panther: World of Wakanda. The project will include Roxane Gay co-writing with Ta-Nehisi Coates on a series that focuses on various people in Wakanda, the homeland of T'Challa/Black Panther. The project will include contributions from poet Yona Harvey and visual artists Alitha Martinez and Afua Richardson. So far, several media outlets have highlighted that Gay will become the first black woman writer for Marvel. Gay noted on Twitter that " It doesn't make sense that I am the first, in 2016. But I won't be the last." Several black women commentators offered critiques of Coates's Between the World and Me (2015) when it was published, saying that he did not make black women experiences more central to his work. Coates was aware of some of those critiques, but, as this recent Marvel announcement suggests, he has moved in a different, possibly more progressive direction. Rather than speak for black women figures in his work, Coates effectively facilitated an unusual and important opportunity for 4 black women -- Gay, Harvey, Martinez, and Richardson -- to become creators and contributors to a major comic book project.